Fixed those mistakes, for Divinity I just went with the GO set up cause that was the one I saw on the wiki but I'll move it. Sorry, but the sword was definitely used against Asterios. It's in the Asterios GO story. Magecraft with incantations of three bars or fewer are nullified. She does not sustain most of the damage from High-Thaumaturgy or Rituals. Normally, a high rank would be conferred as there are anecdotes of the Valkyrie riding flying horses. However, because of 「Mad Enhancement」, she is no longer skillful enough to properly take the reins of a phantasmal species. She is also unable to operate complex vehicles for the same reason. Furthermore as she constantly consumed by flames, no animal would allow her on its back. Functionally, the 「Riding」 skill is lost. If she was summoned as a Rider, the rank of the skill would be in line with the legend. When Saber decided the battle for Agnar instead of Hjalmgunnar, as punishment, Odin transformed the top of Hindafjall into a realm of the dead and separated it from the world. In the middle of this tiny world, he wreathed a building in flames that reached the sky and surrounded it with a wall of divine shields. This was to be Saber’s prison until the twilight of the gods or the fated hero who would awaken her. The dwarf Andvari’s greatest treasure. The ring was cursed to bring misfortune and destruction to the possessor. It eventually found its way on Brynhildr’s finger after a trail of destruction from the fall of Loki, to the transformation of the dwarf prince Fafnir into the Evil Dragon Phenomenon. On the outside it looks like a simple golden ring with the rune for power carved into it. However, it is a magical ring able to produce gold. Because of the curse, the holder’s luck can never exceed E rank. Even so, Saber keeps it with her always, a reminder of a proposal even if the proposer has forgotten and no longer with her. A Servant who can only be summoned by a corrupted Grail. They do not have the “sparkle” of proper heroes. They include Heroic Spirits like Medea. Medusa, and Ibaraki-Doji who are not pure Anti-Heroes but are not proper Heroic Spirits either. The difference from an “Alter” Servant is that an Alter is an Alternative of the Servant that was created through external methods. Servants that are closer to vengeful spirits are a true aspect of the Heroic Spirit; however, that aspect is not worthy of being a proper Heroic Spirit. Examples include Gilles De Rais or Lancelot. Brynhildr as a Lancer, Rider, and Caster are undoubtedly worthy of the title Heroic Spirit. As a Saber on the other hand is Brynhildr at her lowest, she had just killed her beloved Sigurd and held nothing in her heart other than madness and a need to burn the rest of the Gjúkingar. She is the brightest flame before the fall. Although she once had aptitude as a Divine Spirit, her divinity is extremely low. She was once a member of the battle maidens and daughters of the chief god Odin, the Valkyries. However, Odin revoked most of her divinity. A skill which comes from the anecdote of her sleeping in a building engulfed in flames. Even if the kindle for the flames is magical energy, as her hatred deepens the flames can become even stronger. Saber is constantly burned by her flames. For her, they represent the pain of being alive. Endowed with runes, the magic crests of North Europe. A first-class magus she taught her beloved Sigurd Runic Magecraft. As a Saber and because of 「Mad Enhancement」, she is no longer able to use the 「Primordial Runes」 that the chief god gifted her. The only vestige of this skill are the two unconnected halves of the rune of sleep that has assimilated with her mythril armor. Going berserk to raise one’s abilities. While she still has some reason and is able to come to a mutual understanding with her Master. The need to burn those she hates is too strong. Ironically it is the pain of being alive that Saber craves. Therefore she will continually seek a stronger, hotter flame. For that will surely burn her. A composite Noble Phantasm. The ring is attached underneath the hilt of the demonic sword and because of the ring’s power, the sword is now completely golden. All those who see the sword without the sufficient mental resistance are afflicted with a fascination and desire for it. The moment this sword cuts into an opponent under that mental condition, whatever was touched draconizes. At the same time, this sword deals extra damage to those descended from dragon-kind. Brynhildr’s qualification for the Saber class as well as the tool she used to kill herself. If the cursed ring Andvaranaut is the beginning of the tragedy, then the demonic sword of the sun, Gram sings the end. In other words, this Noble Phantasm is the culmination of the Volsung Saga, displaying its draconic attributes to its fullest. It was the ring Andvaranaut that seeded the avarice that transformed Fafnir into a dragon and it was by Gram, the dragon-slaying, sword that he was undone. In short this is a cycle within a cycle. Whatever was born from this blade shall be instantly ended by this blade. The rank of the sword is lower than it usually is because Gram is also a sword which selects the king. Without the qualifications Brynhildr cannot release its true power as the strongest demonic sword. The reverse of Brynhildr Romantica. If the spear of love and hate is the romantic passion of the legend manifest. Then this Noble Phantasm is the sword of reality after all those illusions have been burned to ashes. What is left after Brynhild killed Sigurd is only hatred, curses, and mad flames. Andvaranaut’s curse is fused and fuels the hottest and strongest flame that Brynhildr can muster before being concentrated into Gram that radiates the attack with its attribute as a solar sword. This is not an Anti-Army attack, but rather a curse that seeks the target of Brynhildr’s hatred and burns them until they are nothing. Therefore, what is required to defend against this Noble Phantasm is not heavy armor, but a great resistance to curses. The greater Brynhildr’s hatred is towards the target, the hotter the flames shall be and the stronger the Noble Phantasm becomes. The name of the Noble Phantasm is the beginning of Brynhildr’s soliloquy and her final desire. However, in this context, she is referring to how her enemies are the ones who shall be the foundations that her funeral pyre will be built upon. Bounded Field, Pseudo-Suicide Noble Phantasm. After invoking the True Name, Brynhildr plunges Gram into her chest, joining the two halves of the rune of sleep, throwing her into suspended animation while expanding a bounded field. All target caught within range are trapped in the same prison she was, a realm of the death with no escape, forever being burned by a ring of fire that stretches to the heavens above. Conceptually defended by a wall of divine shields that nullify attacks from the past or future as well as being spatially isolated from the world, the bounded field is near impossible to breech and on the order of Divine Spirit magecraft. In her suspended animation form, the immobile Brynhildr can easily be killed; however, the only way to dispel the bounded field is to pull Gram from her chest and awaken her, that is, reviving her. Needless to say, there are not many worthy of the strongest demonic sword Gram nor Brynhildr’s love. For Brynhildr, being alive means feeling the fire of passion. Death for her is when that fire is burned out or extinguished. The life she led before Sigurd cut through the thorn of sleep is nothing but death for her. Therefore, her suicide by stabbing Gram through her chest is symbolic of her resignation to that old life, only this time, Gram has become the thorn itself. Only someone who can stir her as much as Sigurd did is able to pull out the sword. Until then, all who are trapped in this realm will burn until Ragnarok. The Noble Phantasm also represents the Hall of Fire that Brynhildr created on her funeral pyre when she stabbed herself with Gram. It is both the death before her birth and her actual death. This aspect of Brynhildr is from the only time she wielded a sword of note. That is, after she had killed Sigurd and before she smote herself. Having killed her beloved Sigurd with her spear, at that moment she was devoid of love, only bearing hatred and madness. These were no embers, but the flame burning its brightest before it sputters out. There are no more excuses, only a feeling and a need to keep that feeling aflame. Without love, the only way to do that is to go to the other extreme and hate. Hate like she hated Gunnar and Gudrun and more than anything else, to hate Sigurd. While she is infinitely close to a Berserker, she does not qualify as an Avenger. There is nothing to avenge here, just a fire that must keep burning for one’s own sake. Even if she can longer feel the fire itself. Therefore, let a greater fire be built, a larger, deeper, hotter, brighter, fire. It is on that fire I shall cast myself upon and burn. Brynhildr’s wish for the grail is to continue burning. The moment that Brynhildr awoke and saw Sigurd, she, who had been an automaton her entire life, felt something. It is by mindlessly following this feeling and clinging to the need to keep feeling that led her down this road of destruction. But still, it is something that she cannot deny. Even if her beloved is dead… actually, it doesn’t matter if her beloved is dead, as long as she can feel, she will keep protecting and fanning that feeling. For something that has never felt anything before in her life, no longer feeling is death. A Bryn with no more dere in the yandere. The final flame so to speak of Brynhildr and the conclusion of the passion she wrought. In the end she was too innocent and naive. The wish to keep feeling what I'm feeling and the fear of having those feelings taken away proved too strong and burned all those she cared about. The earnestness of a divine automaton that became human. Now that I'm typing this Brynhildr's story is kind of like a parallel to Manaka's. Makes you think. Last edited by You; July 23rd, 2017 at 12:15 AM. You: Wow, that Brynhilde sheet is pretty awesome. Every part is so thoroughly woven together with the core concept that there's basically nothing to criticize, though I do have some parts to remark on. With how her third NP works, it sounds like anyone who manages to actually pull the sword out might have a chance at redeeming her. Is that you envisioned it? Sir Lucan was the Duke of Cloucester, son of Duke Corneus and half-brother of Bedivere. One of Arturia's first Knights of the Round, he was appointed as Royal Butler at the same time Kay was named Seneschal. Lucan fought valiantly in the battle of Bedegraine; we can probably assume that he also fought at Terrabil and on Humber bank. Through most of Malory's work Lucan remains in the background, presumably carrying out his duties as butler. However, there were a handful of times where he did leave the confines of Camelot and sought adventure. At least three times during the books of Tristram Lucan shows up riding by and for a exciting quest. As more knights joined the Round Table, Lucan began to be overshadowed by the likes of Lancelot, Gawain, Percival and among others. But knowing his limitations as a knight, Lucan settled down and served Arturia and Camelot with unparalleled dedication. Lucan remained with Arturia when the split became between the King and Lancelot. And with Bedivere, he was one of the last two knights left alive with Arturia after the Battle of Camlann. And when Arturia was determined to kill Mordred, Lucan tried to prevent the King from taking this rash decision. Unfortunately, Mordred died while Arturia was mortally wounded. Despite suffering from grievous wounds of his own, he and Bedivere took the dying Arturia to safety in hopes of saving her. Although he was bleeding profusely, Lucan was as desperate as Bedivere in their futile attempt to save the King. Once they reached the forest, both Lucan and Bedivere laid Arturia against a tree hoping the purity of the place will prevent her from dying. Alas, Lucan was unable to follow his half-brother to the end; as they laid their king against a tree, Lucan’s wounds finally burst and killed him instantly. Judging from appearance alone, one may mistake Lucan to be Bedivere for their striking resemblance. However, this is where the similarity ends. Stoicism given form, Lucan looks composed and focused at all times. He takes his duties with the utmost seriousness, even a task as mundane as shopping will be carried out with maximum effort. Even in the face of grave danger, he looks back with a level mind and plan an optimal course of action. Like his half-brother Bedivere, his loyalty to Arturia is exceptionally strong - although for different reasons. While Bedivere served Arturia for the sole fact that she was King, Lucan served the King for her selfless ideals. Knowing that the path Arturia chose is an arduous one, Lucan acted as her shadow - ready to serve at a moment’s notice. But because of his admiration for her ideals, Lucan is unable to truly realize Arturia's plight - for he sees her more as a King than a person. Despite that, Lucan will do all he can to ensure Arturia's well-being, for even rulers require times of respite. In spite of his stoicism, the knight had shown more emotion and concern to both Arturia and Bedivere than anyone else; for the former being a worthy master/King since the early years and the latter was both family and an equal to Lucan. Even he temporarily lost his calm demeanor when Arturia received her fatal wound during the Battle of Camlann, and was desperately forced himself from dying all to ensure his King’s safety. That said, Lucan does have his limits in terms of patience; should anyone insult Arturia or Bedivere in any way, expect an irate retort being thrown back. But of course, he would retort politely - as the Royal Butler should show civility and restraint. Because Lucan supported his King’s ideals, it’s no surprise that he strives to make that dream of hers real. In turn, Lucan would only answer the call of Masters who hold an equally righteous view. If the Master didn’t measure up to Lucan’s standards, he would influence them to become as much of a paragon as his late King. For good or foul, Lucan believed this is the best way to spread Arturia’s legacy. The King’s life and safety is of the upmost importance. The battle was a major blow to both sides. Valiant men died on both sides. If this were to continue, neither Bedivere nor I can ensure our King’s survival. Compromises must be made. There is still a chance to salvage what we could. This may not be an ideal scenario, but we will live to see another day. Hopefully, this will buy us enough time to recover. The King was adamant. Despite all reasoning and premonitions, this fated clash between King and Usurper was inevitable. But as is the King’s orders, I will obey nonetheless. But alas, I cannot resist. My blood bursts from my wounds, a painful reminder of my limits. I will now place everything onto you, Bedivere. I'm afraid that I can't serve our King any longer. My King... Was my service... Acceptable...? Bedivere: Arguably the only Knight of the Round in which Lucan is the closest to. After Merlin and Kay's departure from Camelot, he and Bedivere stepped in and became Arturia's pseudo-advisors, in which both gave their all in. And from their experience serving their King as Steward and Royal Butler respectively, both have pretty much knows what the other is thinking at all times. And due to being the older one of the two, Lucan would often act as the aloof brother and chides Bedivere for not keeping up with their training back in childhood. But now with both serving as Arturia's aides, the Royal Butler and Steward both aknowledge each other with mutual respect. ...But to this day, Lucan remains the #1 in terms of household maintenance. EMIYA(Archer): "Looking at your household and culinary skills, I daresay you are truly worthy to be a formidable manservant. However - it is this very fact that I, the King's most loyal servant, shall not let this stand. I assure you, I will out-butler you and leave you in the dust!" Lucan, just admit that you're jealous because of Arturia relying more on EMIYA than you. Agravain: While he distrusts the knight, Lucan does have to commend his dedication to support Arturia. The fact that Agravain is almost as efficient and hardworking as him only spurred the Royal Butler to outdo the other knight in return. In a way, Agravain is almost an motivation for him to overachieve even more. Arturia Lily: "W-why, hello there, little one. ...I look like someone you knew? hmm, I hope he did his job well in accompanying you in your journey. ...I nearly forgot that my King was this innocent and carefree. While this behavior didn't last, this chance encounter did leave a sense of nostalgia; I could almost vividly remember the times I had to rein in even that flowery magus at times... (shudder) Those memories were repressed for a reason..."
Grants protection against magical effects. Differing from the developed Resistance that merely rejects magical energy, this Skill cancels the spells altogether. Cancels spells with a chant below three verses. Even if targeted by High-Thaumaturgy or Greater Rituals, it is difficult for them to be affected. The ability to ride mounts and vehicles. While this Skill covers all beasts and vehicles, dragons are an exception. In Lucan’s case, he can handle most vehicles with above average skill. However, the knight suffers a demerit if he were to ride an animal mount - especially if the mount-in-question is a horse. This was probably due to that one time where he was severely hurt after a freak accident during a jousting match that both Tristan and Ywain dragged him to Gannes Abbey to heal. Afterwards, Lucan was rather reluctant to ride on a horse. A Skill that allows for the continuation of combat after sustaining mortal wounds. It will also reduce the mortality rate from injury. This Skill represents the ability to survive and the mentality of one who doesn't know when to give up. Consisting of one's strength of vitality in predicaments. Best results of this Skill is achieved when a resilient body is combined with this Skill. Doesn’t know when to give up, even to the bitter end. Aside from his wit, Lucan was known for his staunch willpower and ability to persevere in Arturia’s name. This was proven when he carried the mortally wounded Arturia for miles on end while having grievous wounds that should’ve killed him long before the retreat. It was when the King was taken to the forest did Lucan’s wounds finally kill him. The ability to possess a steady and focused mindset, even in the face of great adversity and danger, one retains their level thinking. Unlike Bravery, this Skill not only negate any mental interference and any sort of emotions that clouds focus, but also allow a calm assessment of the situation at hand and the selection of the most effective course of action. Although he was mostly served as the Head Butler of the King Arthur’s court, Lucan’s calm demeanor and critical thinking more than makes up for his lack of strength in battle. This was evident during the Battles of Bedegraine, Terrabill and Humber Bank, where he wove through dozens of enemies through planning alone. And even during the slaughterfest that was the Battle of Camlann, Lucan stayed levelheaded and attempted to dissuade Arturia from confronting Mordred - fearing that neither the King or the Traitor will make it out alive. Even when he suffered multiple wounds while escorting the dying Arturia to safety with Bedivere, Lucan kept steady to retreat to safety. …Because of his stoicism, he may be one of the few people who remain nonplussed with Kay’s insults and sarcasm. A Skill afforded to those most valiant feats were performed in service to an even greater hero. Rather than fighting along on the front-lines, the user’s martial prowess shines brightest when he is allowed to take a supportive role in combat. When battling alongside a hero the user recognizes as even greater than themselves, the user obtains a rank-up to all parameters and a bonus to all saving throws. While Kay was the Seneschal, Lucan was the Butler to Arturia and her court. Although he spent a majority of his days keeping the castle in working order, Lucan was also known to be the first few knights to accompany Arturia during her early years. And when Arturia enters the fray, Lucan was known to carry both the banner of the Pendragon Crest as well as Rhongomyniad in several instances. Later on, Lucan was one of the few who stood by her side to the bitter end. This was duly proven when he defended the dying Arturia from brigands during their retreat from Camlann, sustaining even more wounds during the escape. And in certain variations of the legend, Lucan spend his last moments by returning Excalibur to the Lady of the Lake. Fitting for Lucan’s secondary role as the Butler of Arthur’s Court, or the Cup-Bearer of the King. While it was his duty to overlook the workings of the household, it was a butler’s most important duty to provide the wine - a major tradition throughout the centuries. In Lucan’s case, he personally bore Arturia’s cup and had a major sway during feast and rituals. In certain cases, he personally gift a flask of Camelot’s best wine as a blessing to those who were to undertake a grand quest. Upon speaking the NP’s True Name, a opulent pitcher or glass of wine will appear in his hands. Upon drinking its contents, any human will find their fatigue and ailments healed, along with being blessed with good fortune. If it were for a Magus, they gain an above-average ability to dispel hostile magecraft akin to B-ranking Magic Resistance. If it were offered to fellow Servants, their physical Parameters will increase by one rank, and they will not require the Prana from their Master for a period of time. In a way, this NP can be offered like a Proof of Friendship, with the sharing of wine being a ritual of mutual agreement. Since most deals are sealed with a drink, if the opponent broke a deal/promise made with Lucan in any way, the enchantment offered by the wine will instantly be dispelled. But as the duty of the Cup-bearer of the King to taste-test the drinks for poison, Lucan must drink first to prove that the exchange is without treacherous intent. As such, it is physically impossible for anyone else to drink the wine before Lucan drinks it first. Meaning that poisoning the wine beforehand is highly counterintuitive. Additionally, there is also a small yet probable chance that the wine will have the opposite effect, with an added bonus of bizarre hallucinations for an indefinite amount of time. The blade Lucan wields possessed no name at all, but is referred as one of the many Claidheamh Soluis, or “Blade of Light” from a myriad of Irish and Celtic legends. The origins of the first Blade of Light was unclear, with many sources claiming it to be an embodiment/legacy of legendary weapons, from Lugh’s sling to even Excalibur itself. Because of the blade’s connections to these other legendary armaments, it becomes stronger from their influence. In a way, “Golautalch” isn’t really a name, but a stated fact of the weapon’s existence as a mere fragment. By uttering its “Name,” the weapon draws its strength from the many legendary weapons of eons past, powering it up in the form of light emitting from the blade. However, just by drawing from the legacies of the past only change the blade into a D-ranking NP. In actuality, it draws power primarily from the NPs wielded by other Servants. The more relation with Golautalch the other NP possesses, the stronger Golautalch gets. For example, Gáe Bolg will only up it by one rank; although it is a weapons of great renown, it bears little relation to the Swords of Light. In turn, weapons like Excalibur, Airgetiam, or even Caladbolg will strengthen the sword by two ranks. But in order for the strengthening to work, the other Servants must have their Noble Phantasms at hand. Also, this only works for weapon-based NPs, not conceptual ones. Being an embodiment to the various legendary arms, Lucan can give up the strength of Golautalch to power up another weapon-based NP. Not only will the recipient’s NP will increase by two ranks, their weapon will be basked in golden light, similar to Excalibur. If weapons like Excalibur Galantine receives this blessing, expect a attack of massive destructive potential. However, after “giving” Golautalch to someone else, this NP will be permanently sealed afterwards. Credits to Royd for the Hero's Attendant Skill. George's second NP actually does turn people in dragons, physically too. So if someone grabbed the sword and didn't let go they would eventually turn into a dragon. For something as quick as say a shallow cut, only the area around the wound is turned into a dragon. But yes there would benefits of say having scales on your wrists or wherever. And yes for the Third NP that is what I was going for. But of course without throwing the ring away, tragedy would probably strike once more. Lucan: Never heard of this guy before at all, but your take on him seems pretty interesting. I appreciate that you found a use for my Hero's Attendant Skill as well. To be honest, the wine NP feels like a bit of a stretch unless the wine was actually described to have mystical properties in the legend(s). I quite like his second NP though. Out of curiosity, how do you think this guy would get along with my Iolaus (shared passion for butlerdom) or Kay (clashing personalities and drastically different takes on courtly honor) Servants? Finished making edits to my sheet, tweaked his skills a little bit and added a little on personality mostly. Given the butlers of the Olde Days were primarily involved in the handling of wine, I decided to spin it a little more. 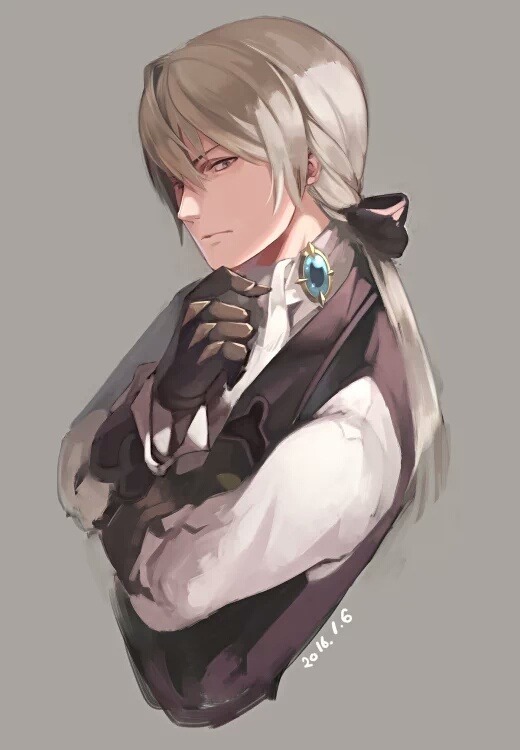 In regards to reactions, Lucan would regard Ioalus as kindred spirits, for both butlers regards the other's masters as proper heroes. Honestly, I could see Lucan trying to learn from Ioalus to surpass the older man in the arts of butlery. Since Iolaus has seen his fair share of adventuring at Heracles' side, Lucan would definitely be interested in hearing the old Saber's tales. Together, the duo will be the ultimate Support Saber Team. Lucan's reactions to Kay, however, will be less than positive. Since Kay left right before Mordred's rebellion, Lucan took his leave as an act of betrayal. For Kay was considered to beboth family and the first companion to Arturia, and leaving her side when she needed him most was a grave issue in his eyes. As such, chances of cooperation is impossible between the two, and that's not even counting their completely different temperaments. In turn, how would Iolaus react to Lucan? Oh my god you all need to stop. Last edited by SleepMode; July 23rd, 2017 at 12:05 AM. I guess he's saying it's in some sense bad for us to be speculating on how our Servants would interact? I don't understand the logic though. For what it's worth, Iolaus would probably come to respect Lucan for his devotion seeing as he considers 'protecting the ones important to you' to be the definition of a proper hero rather then skill or strength. Nice sheet You. And I liked yours too Skull. Lucan: I was gonna reserve all criticisms for once the voting period began but this was small and silly enough to bother me. Why must Benditio Gwin be served to someone else before he himself drinks it? Considering one of the roles occasionally attributed to cup-bearers is food-tasting for poison, shouldn't it be the other way around? I'm guessing to most of the general public just spending a good portion of your time writing up various historical figures as pseudo-anime characters is pretty cringy in itself. Embrace it! When you think of it that way, it's understandable. However the idea of two people from different origins interacting fascinates me at times. But hey, I'm a sucker for characters so what can I say? In the end, whether it's foolish or not really depends on the person. It's straight up cringe all over. If you want people to look at your sheets and give positive feedback then just be straight up and ask, no need to couch it all in Gaia Online-esque "h-hey do you think your char likes mine I hope he does" because it makes you come across a bit as an insecure 14-year old. I mean I can't actually tell you what to do and you can do what you want but I kinda like the sheets you write Royd so I don't take pleasure in picturing you as a simpering little fisherman. I assume the intent was to portray his selfless service (as the wine is fundamentally something intended for others, not himself), though you're right that there could be a justification for being able to use it himself anyway.